The title of this recipe is a lie. This isn’t a soup. But it’s not a stew and it’s not just a pasta main course, so I don’t know what else to call it. Technically, it does have broth in it, so therefore I qualify it as a soup. And since it’s my blog, I get the right to label it however I want to! But this is my disclaimer– there is nothing light weight or soupy about this dish. It is delicious and easy and full of flavor and takes just a few ingredients and a few minutes to make a whole meal. 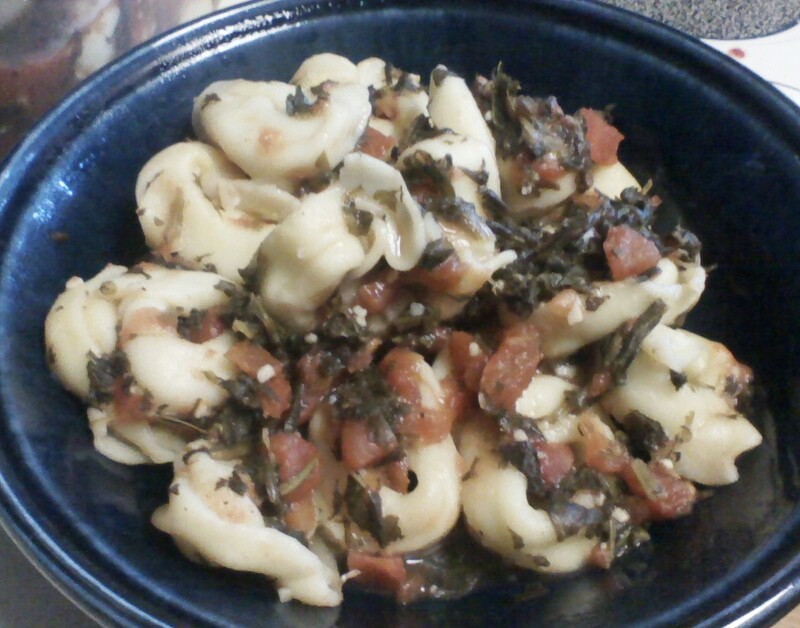 BUT– all of those details are way too much to put in the title, so I just call it tortellini soup. Enjoy! Put all ingredients EXCEPT tortellini in the crock pot. Cook on high for 3 hours. Add frozen tortellini to the pot, stir it around and cook on high for one more hour. Top with a little Parmesan cheese when served. I loved this recipe! I put it on the stove since the crock pot is on the DL. The whole family loved it!! What a great way to sneak in a bunch of healthy veggies.